To get some idea of how misleading such a description is, one must first be familiar with the evidence - which consists in this case of just one manuscript, not “some manuscripts.” So let’s get a good look at the minuscule 1333, a manuscript which currently resides in Jerusalem, where it is cataloged as Hagios Sabas 243. Black and white page-views of the manuscript are available at the website of the Library of Congress. The manuscript has been prepared for liturgical use: αρχη and τελος symbols appear frequently, and incipit-phrases are often supplied in the margins. The Heothina-readings are marked. Symbols (such as ※ and ⁘ and ⁒) of the sort which one might initially assume would link the text to marginal corrections lead instead to liturgical notes (most of which assign readings to specific days). Damaged lectionary-tables appear before the kephalaia-list for Matthew. Matthew begins below a headpiece similar to the kind often found at the beginning of lectionaries. Matthew 6:13 includes the doxology to the Lord’s Prayer. Matthew 16:2-3 is included in the text. After the last page of Matthew, on which three lines (from Mt. 28:20) are written across the page, the chapter-list for Mark follows on the next page. There is no subscription. Mark begins without a headpiece. Mark 16:9-20 is included in the text and is identified in the margin as the third Heothinon-lection. After Mark 16:20, a table of lections for Saturday and Sunday appears in the next two columns, beginning with a headpiece. Before the chapter-titles for Luke, there is a filler-page. Luke begins beneath a headpiece. Luke 22:43-44 is included in the text. The last six lines of Luke are written in a vortex format, that is, the lines are centered and become shorter as the end approaches. There is no subscription. John 8:3-11 is written on the page between the last page of Luke and the page which contains the chapter-titles of John. The writing begins with a title that covers both columns: The reading for the 8th of October, for Pelagia. 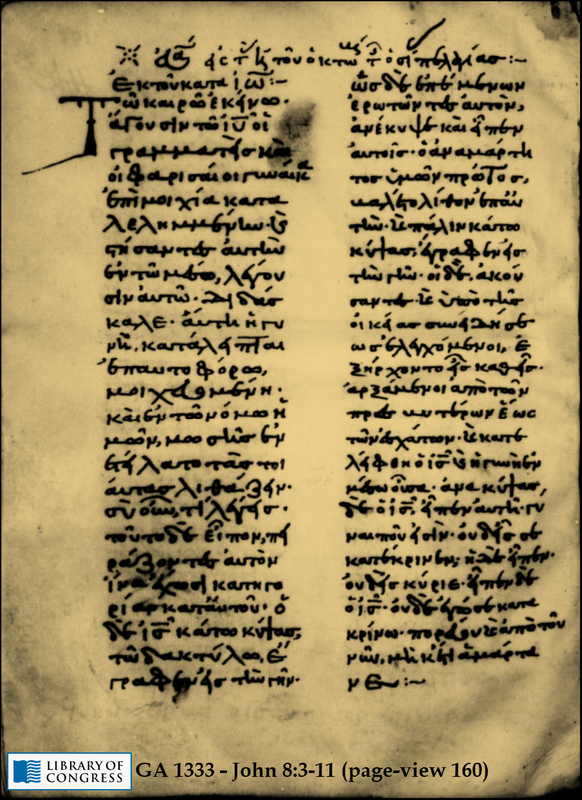 Then the first column begins with the words, εκ του κατα Ιω, that is, “From the [Gospel] according to John,” the usual sub-title used in lectionaries to introduce a lection from the Gospel of John. This is followed by Τω καιρω εκεινω, that is, “At that time,” a routine incipit-phrase used to begin readings. The rest of the text on the page consists of John 8:3-11. John 7:52 is followed by John 8:12 in the text. A symbol resembling a patriarchal (two-barred) cross appears between the two verses. Earlier in the text (on the facing page) the beginning of the lection for Pentecost is indicated in the text, and the lection is named in the upper margin. The closing lines of John 21 are formatted in a cruciform shape. Arabic notes then appear. A few Arabic notes and a brief Greek prayer appear near the end of the manuscript on leftover pages. ● When 1333 was produced, it was copied from an exemplar that did not contain John 7:53-8:11. ● John 8:3-11 was added between the end of Luke and the chapter-list for John in order to provide the otherwise absent lection for Saint Pelagia’s feast-day (October 8). ● The titles that precede John 8:3-11 in 1333 show that this passage was not floating or fluttering around as an independent tradition; the passage is clearly identified as a lection from John. It is misleading to describe it as an “independent pericope,” inasmuch as the person who wrote it had to have depended on a source in which it was identified as a part of the Gospel of John. John 8:3-11 in 133 is not formatted in a way that can be reasonably construed as if it were seen as part of the text of Luke, nor is it formatted in a way that can be reasonably construed as if the scribe obtained his text of the passage from some independent non-Biblical source. ● When and where John 8:3-11 was added to 1333, John 8:3-11 was part of the annual cycle of readings in the Menologion. ● 1333 was initially formatted to include filler-pages; the presence of John 8:3-11 before the chapter-list of John and the presence of a lection-list before the chapter-list of Luke are probably both the work of a later scribe who used the filler-pages as a convenient place to add materials that would render the manuscript more useful for liturgical reading. Isn't 1333 a bit of a late witness to this passage ? Is there any earlier manuscript evidence out there ? 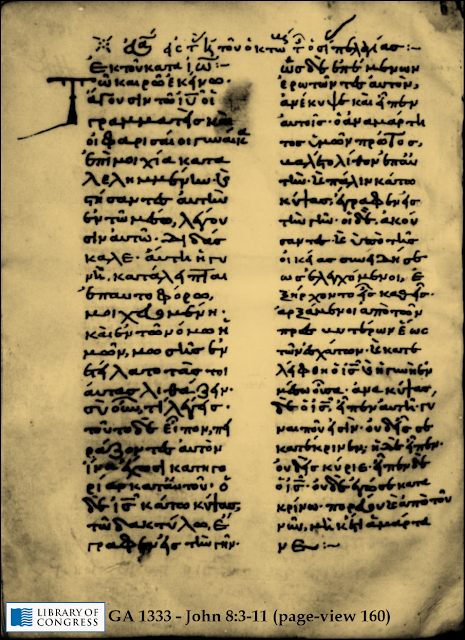 Certainly there is much older manuscript evidence for the story about the adulteress: Codex D (assigned to c. 400 by D. C. Parker), and the MSS used (and mentioned) by Jerome, and the Syriac Didascalia, and a form of the Old Latin chapter-summaries that appears to have originated in the 200s. Just search the blog for "John 7:53-8:11" and "pericope adulterae" and plenty of evidence regarding this passage (and critiques of misrepresentations of the evidence) should be at your fingertips. Much of the same data can also be found in my e-book, "A Fresh Analysis of John 7:53-8:11." The text is quite different from RP. Has its textual affiliation been identified? Yes. Stay tuned for an update.